Lord Beaverbrook High School is located in Calgary, Alberta with approximately 1,700 students in Grades 10-12. The school prides itself on offering amazing opportunities to their students including outstanding programs in the fine and performing arts. There are approximately 200 students involved in music at Lord Beaverbrook. With four bands and five choral groups, students are offered every opportunity to get involved in music. Hard Choral Vocal Jazz Ensemble, with its 11 members, is one of two auditioned vocal jazz ensembles at Beaverbrook. Each ensemble is made up of dedicated Grade 10, 11, and 12 students that meet twice a week. They are regularly sought out to perform at community and special events, and were featured performers in 2016 at two JUNO events and the ChoralFest Jazz Spotlight Concert at the Ironwood with Edmonton’s ‘Nuf Sed and Dylan Bell. Under the direction of Heidi Wood, Hard Choral explores everything from jazz standards and improvisation, to pop, swing, and Latin. Every year, the vocal jazz ensembles look forward to the Canadian Rocky Mountain Festival in Banff. 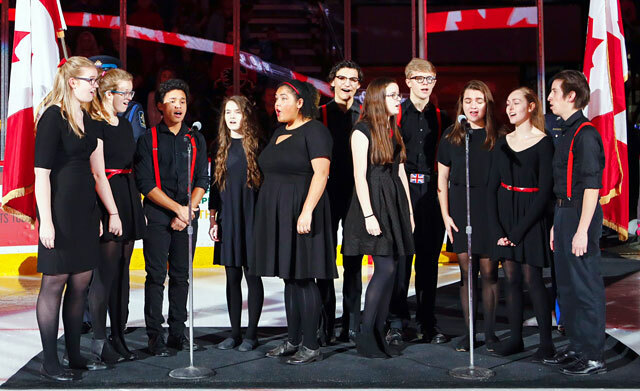 The Beaverbrook Choirs are so excited to share their music with such welcoming festival audiences and to take in the rich musical experiences that the Canadian Rocky Mountain Festival has to offer.